On the 13th of August 1940 an RAAF Lockheed Hudson bomber crashed while on approach to Canberra killing all six passengers and the four RAAF crew onboard. Described as our “most fatal” disaster, the crash shook Canberra in the midst of World War II, and had far-reaching implications for Australia and the war effort. Efforts to commemorate this disaster are documented on file 'PC40/11/0 – Department of the Interior – Memorial : Air Crash Victims – Canberra August 1940', which is ArchivesACT’s August Find of the Month. Of the six passengers killed, three were Cabinet ministers: Brigadier Geoffrey Austin Street (Minister for the Army and Repatriation), James Valentine Fairbairn (Minister for Air and Civil Aviation), and Sir Henry Somer Gullett (Vice-President of the Executive Council and Minister in charge of Scientific and Industrial Research). A fourth passenger was General Sir Cyril Brudenell Bingham White, Chief of the Army’s General Staff. Along with Lieutenant Colonel Francis Thornthwaite (Staff Officer to General White) and Richard Edwin Elford (Fairbairn's private secretary), the loss of these men was a significant blow to the Australian government’s leadership of the war effort. The deaths of the experienced flight crew, Flight Lieutenant Robert Edward Hitchcock, Pilot Officer Richard Frederick Wiesener, Corporal John Frederick Palmer, and Aircraftman Charles Joseph Crosdale must in itself have been a serious loss to the RAAF. 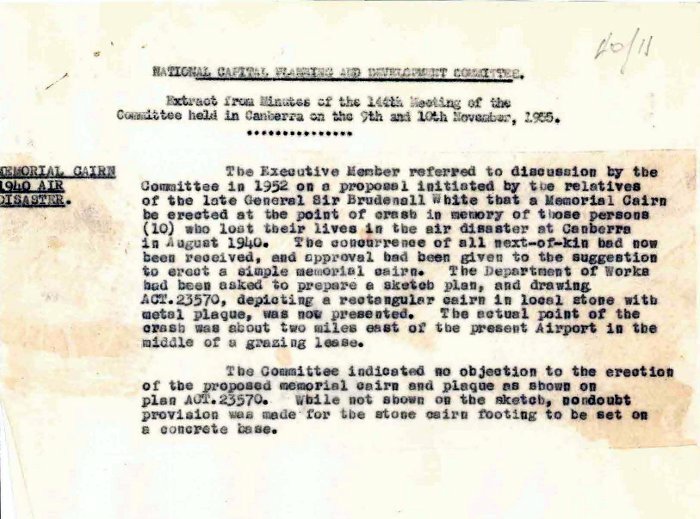 The file 'PC40/11/0 – Department of the Interior – Memorial : Air Crash Victims – Canberra August 1940' begins in 1952 with a request by the relatives of Sir Brudenell White “that a Memorial Cairn be erected at the site of the crash”. 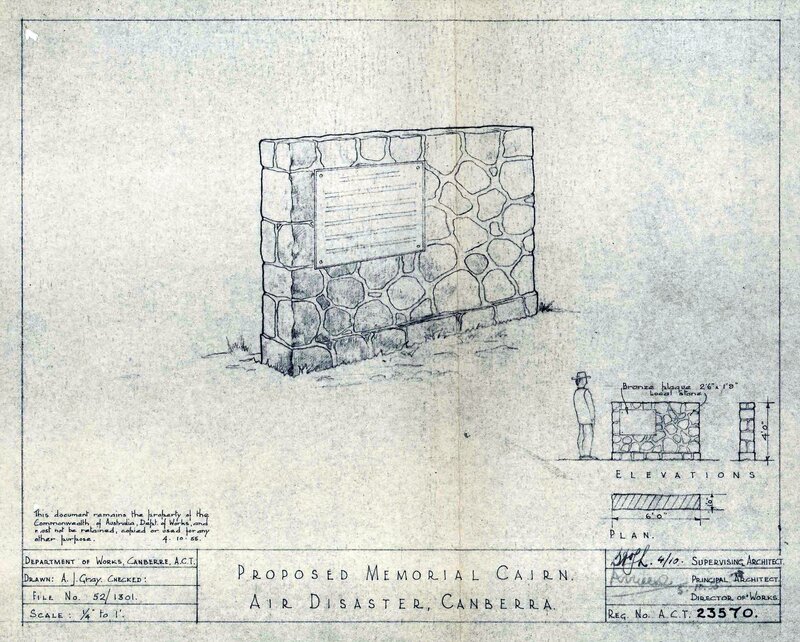 The National Capital Planning and Development Committee was of the opinion “that psychologically it would be inappropriate to erect a cairn at the site of the crash” and that the victims’ memory would be better recorded at the War Memorial and Parliament House, and with the renaming of the RAAF Base to Fairbairn. 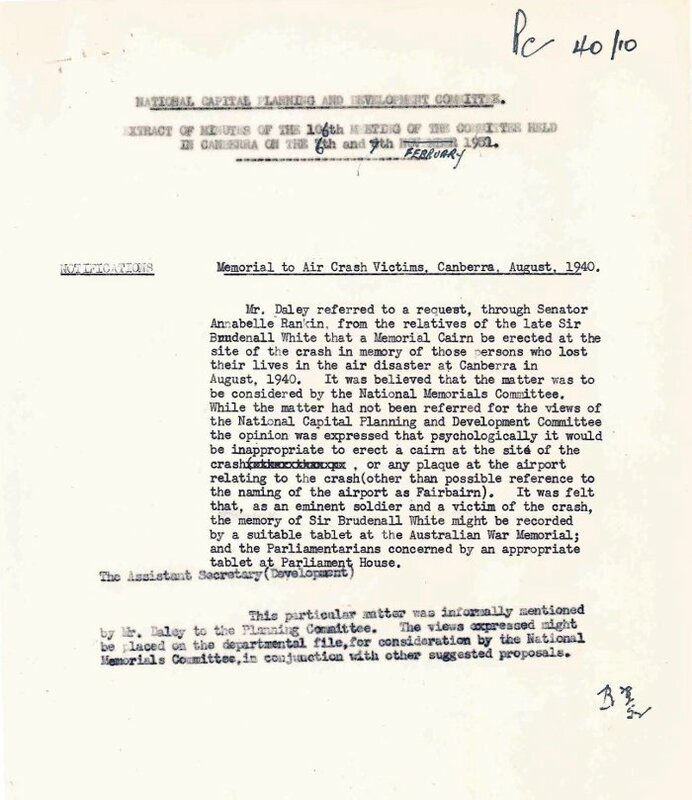 Despite this decision, the Minister for the Interior Wilfred Kent Hughes submitted the proposal to the National Memorials Committee in March 1952. The erection of a cairn was discussed again in late 1955 after “concurrence of all next-of-kin had now been received”. The Department of Works submitted a plan for “a simple memorial... a rectangular cairn in local stone with a rectangular plaque”. The memorial, which was completed in September 1958, is similar to the one originally approved by the National Capital Planning and Development Committee only in its simplicity. Some scholars argue that the loss of the three ministers significantly weakened Prime Minister Menzies’ cabinet, which he was forced to reshuffle following their deaths. Rather than hold three by-elections to fill their seats, Menzies chose to call an early general election. The outcome left Menzies leading a minority government with the support of two independents, who later switched their allegiance. This move handed power to the Labor Party and Prime Minister John Curtin, and, many argue, changed the course of Australia’s war.